I woke up to the sun pouring in my window, the birds singing outside, with a slight breeze blowing the curtains, and snuggled next to Zoe's warm body. It would normally be the perfect way to start a Saturday morning and at first I woke up calm and peaceful. Then I felt this weight come over me. 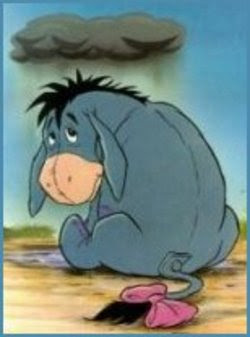 I think I know how Eeyore feels with that black cloud always hanging over his head. My cloud is the assessment center for my National Board Certification. Today is the day when my candidacy officially ends. Today is the last day that I have to prove that I am an accomplished teacher and therefore qualify to be known as a Nationally Board Certified Teacher. To say I am a bit nervous would be quite the understatement. It always amazes me the confidence that people have in me as they all believe I will be fine and I am constantly questioning myself! I guess we are our worst critics though! Anyways I am taking this at 9am and the test center is about an hour away so I will be leaving fairly soon. Looking at the positive side I did schedule first thing in the morning so I can get it done and over with to enjoy the rest of this beautiful weekend. My parents came over last night from Maryland to watch the kiddos this morning and take Dylan to his soccer practice. This afternoon I think I am going to treat myself to some shopping, probably for the kids considering Zoe needs some "shoes to help her run fast" (her words, not mine!) and Dylan has shot up like a weed so some new pants are in store for him. I guess I may just have to keep my eye out for a new summer outfit or at least a purse too!! Then the highlight of the day is that we are going out for sushi tonight. This place has a beautiful outside part where you can sit on big swinging picnic tables next to fish ponds and enjoy delicious food. I can't wait!!! Then tomorrow I need to clean out the shed, kitchen cupboards, and movie drawer...the last three places I need to organize for my spring cleaning. Maybe I will even start a little weeding to work on my tan if it is nice. The thought of the tan is the only thing that gets me into yard work. So there you have it...my weekend plans. Other than this little blip this morning, it should be relaxing and enjoyable. I'll let you know how the test went when I get back. I think what I'm dreading the most is after you take a test when you think of all the things you should have said...hindsight is always 20/20 right?? So what are your weekend plans?? Oh, Mel I wish you the best today! I just left a message on Joyce's blog and saw your beautiful picture of your family. Which led me to your news of today. I can't imagine anyone as dedicated and together as you not passing that damn test. You will beast it! But...no matter what we all love and appreciate you at Banneker.